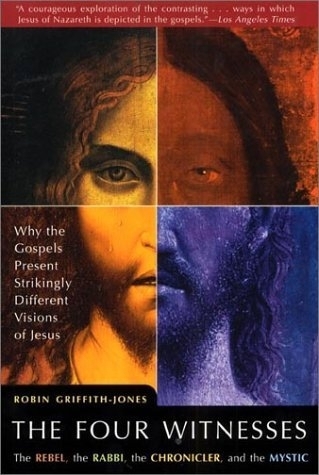 From Amazon: "The Four Witnesses" by Robin Griffith-Jones, Master of the (Anglican) Temple in London, attempts to clarify the distinctions among the four gospels' quite different visions of Jesus. The four witnesses, as Griffith-Jones describes them, are the rebel (Mark), the rabbi (Matthew), the chronicler (Luke), and the Mystic (John). Griffith-Jones asks, "Who were these four writers? Where did they write and when? For whom?" and proceeds to give straightforward, balanced, intelligent answers. "The Four Witnesses" is most intent on making the point that each gospel was first written to speak to the situation of a particular religious community. For many readers, that will come as very good news, because it will help them to hear the particular messages that the gospels hold for their own communities today. For this reason, "The Four Witnesses" will also be a useful resource for Christian education programs in churches of many denominations.